Pickled radishes are a traditional and delicious variety of Japanese pickles. They are a well-known dish made by pickling radishes on a bed of salted rice bran. It is said that at the beginning of the Edo period (in the 17th century), most people began to eat white rice, and as a by-product, the use of rice bran became widespread. Today, pickled radishes are a healthy food that is getting a lot of attention not only in Japan, but in countries all around the world. 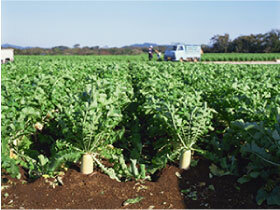 TOKYO TAKUANTARO is a product of safe cultivation and hygienic manufacturing. TOKYO TAKUANTARO products from Tokai Pickling originate from contracted Japanese farms that are subject to strict controls on soil and cultivation methods, locations that produce radishes that are used exclusively for takuan. Furthermore, factories that pay close attention to hygiene management have been established near where the radishes are produced, where the products are manufactured under strict quality controls. 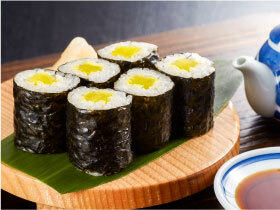 In addition, the products manufactured by Tokai Pickling conform to the quality and manufacturing standards for regulation of food additives as determined by the United States, the EU, Korea, and other countries, making food from Tokai Pickling safe to eat in any location. Enjoy a mellow taste and crunchy texture. 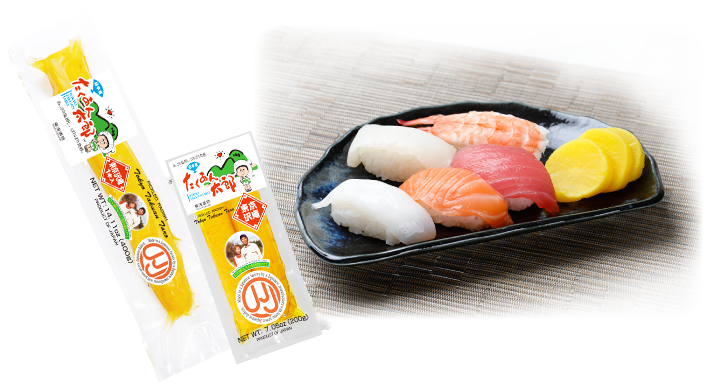 TOKYO TAKUANTARO is manufactured by using fresh radishes and fermented rice bran, resulting in an enjoyable, mellow flavor and aroma. The crisp, fresh texture of these Japanese pickles stimulates the appetite and blends well with different cuisines from around the globe. RADISH, WATER, HIGH FRUCTOSE CORN SYRUP, SALT, MONOSODIUM GLUTAMATE, FERMENTED SEASONING(ALCOHOL, SALT, RICE), POTASSIUM SORBATE(PRESERVATIVE), SODIUM ASCORBATE(PRESERVATIVE), MALIC ACID, VINEGAR, LACTIC ACID, ASPARTAME, ACESULFAME POTASSIUM, FD&C YELLOW NO.5(TARTRAZINE), RICE BRAN.